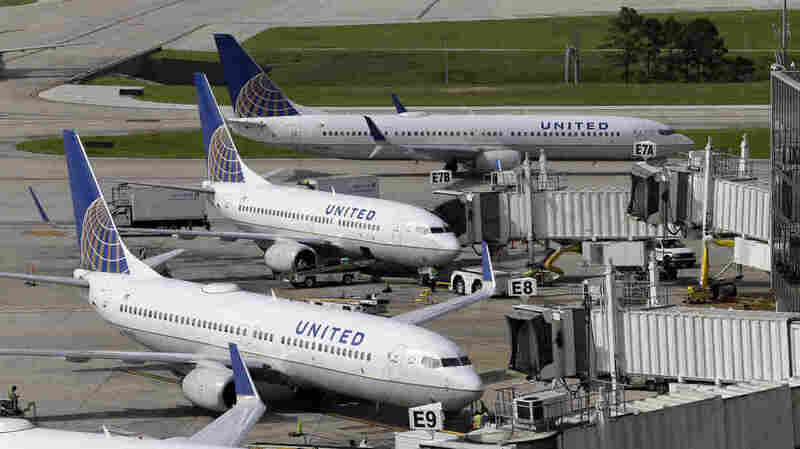 United Removes Bridal Couple From Flight Without Incident : The Two-Way A couple flying to Costa Rica for their wedding were removed from a flight on Saturday. The airline said the passengers repeatedly attempted to sit in upgraded seating that they did not purchase. "Michael Hohl, the groom, said he and his fiancee, Amber Maxwell, were the last to board the plane. "According to Hohl, they noticed a man was spread across their row napping when they approached their seats, 24 B and C.
"Not wanting to wake the man, Hohl said they decided to sit three rows up in seats 21 B and C. He said they didn't think it would matter because the flight was half full with multiple empty rows. "We thought 'not a big deal, it's not like we are trying to jump up into a first-class seat,'" said Hohl. "We were simply in an economy row a few rows above our economy seat." "In a Boeing 737-800 like the one the couple was on, United considers Row 21 "economy plus," an upgrade. "After sitting, Hohl said a flight attendant approached and asked if they were in their ticketed seats. The couple explained they weren't and asked if they could get an upgrade, but instead they were told they needed to return to their assigned seats. "Hohl said after complying with the flight attendant's demand, a U.S. marshal came onto the plane and asked them to get off. "The couple cooperated and got off the plane without incident, but they still don't understand why." "We're disappointed anytime a customer has an experience that doesn't measure up to their expectations. "These passengers repeatedly attempted to sit in upgraded seating which they did not purchase and they would not follow crew instructions to return to their assigned seats. "We've been in touch with them and have rebooked them on flights tomorrow." Attorneys for Dr. David Dao, 69, the Vietnamese-American doctor who was dragged off the flight, say he will very likely sue the airline. United Chief Executive Oscar Munoz apologized to Dao, his family and the company's customers. The airline also said crew members will no longer be able to bump a passenger who is already seated in one of the airline's planes. Shares in United's owner, United Continental Holdings Inc., were hit hard, dropping as much as 4 percent last week.